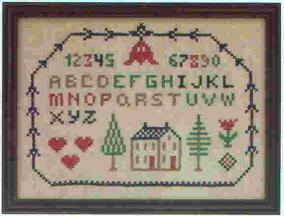 Home > Beginner > Practice Makes Perfect 9" x 12"
Practice Makes Perfect 9" x 12"
This basic alphabet and house cross stitch stamped sampler craft kit is stitched on natural linen to make a striking simple appearance. Quick and easy in a larger X stitch, this is a printed craft kit that any beginner would love as a first project. Printed sampler craft kit well done and simple have a lasting effect as a first project.